Two recent films remind us of the bestseller’s importance to Hollywood. The Blind Side, based on the popular nonfiction book of the same title, relies on the dominant formula in Tinsel Town today: adaptation. From Iron Man to the Narnia tales, the Twilight series to The Lovely Bones, filmmakers and executives alike rely on books that already have a built-in fan base. While The Book of Eli is not an adaptation, it too relies on a built-in audience for a bestseller to drive movie-goers to the theater. The book that Eli is carrying to San Francisco, after all, is none other than the bestseller of all time: The Holy Bible. But these two films have more in common than the fact that they have books driving them; these two films brought overt Christian themes into mainstream Hollywood entertainment, an uncommon practice since – and perhaps this isn’t even that much of an exaggeration – Cecil B. DeMille. Film-goers witnessed Eli (Denzel Washington), Solara (Mila Kunis), and the Tuohy family praying before a meal; close-ups of a Bible; and Leigh Anne (Sandra Bullock) wearing a cross on a chain around her neck for the entire movie. Moments like these and many others caught some viewers by surprise, unused to Hollywood cinematic storytelling that blows in the Christian direction. Both films were successful as well. 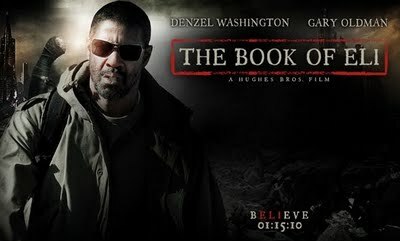 The Book of Eli has cleared $147 million worldwide while The Blind Side is considered a huge hit with nearly $300 million in worldwide box office sales and a Golden Globe along with an Academy Award for superstar Sandra Bullock. All of the aforementioned information leads us to two questions: one, how did these films get made? two, why have they done well? I have already provided one reason these films got made: they had popular books driving them and, thus, a built-in fan base. But could there be other reasons? To begin, let’s examine the production road for The Book of Eli. J.D. Washington, son of Denzel, is described as a devout young man. He read Gary Whitta’s script and persuaded his father to do it. Thus, a person of faith endorsed the material and was able to garner star support. The Hughes Brothers who were attached to direct also have a person of faith between them – one of the twins, Allen, is also described as devout. The film was produced by Alcon Entertainment. Steered by partners Broderick Johnson and Andrew Kosove, this firm is not helmed by MFAs from NYU Tisch or USC, artists with liberal axes to grind. Rather, Johnson and Kosove spent time on Wall Street before coming to Hollywood to realize their dream as film producers. They have economics degrees from Princeton and are driven by market forces. They know that between Pasadena and the suburbs of Jersey, there are a whole lot of people of faith with money in their wallets burning a hole for spiritually uplifting fare. And who financed Alcon Entertainment? Once again, someone outside of the LA – New York literati “elite" – Alcon Entertainment is financed by none other than Frederick W. Smith, founder and CEO of Memphis-based Federal Express. In other words, they’re financed by a businessman smack dab in the middle of the Republican Bible belt. Now let’s turn to The Blind Side. How did this film get made? John Lee Hancock, the writer and director – and a graduate of Baylor no less, believed in the material and fought for it, much like J.D. He brought it to Julia Roberts who turned it down then to Sandra Bullock who also turned it down. Determined to see his dream realized, he flew Bullock to meet Leigh Anne – and Sandra was hooked by the dynamic Southerner. Now Hancock had his star support. And who produced and financed The Blind Side? None other than the aforementioned Alcon Entertainment and their backer Frederick W. Smith. So, to recap, how did these films get made? Both had a person of faith who believed in and championed the material: J.D. and Hancock. Both eventually gained star support: Denzel and Bullock. Both had businessmen who considered economics over ideology and an investor who is part of the Christian, Republican network of Memphis – and thus outside of the LA – NY ideological corridor. Gary Whitta and John Lee Hancock seem to hold these truths as self-evident – both writing scripts during this difficult era that provide viewers with emotional and spiritual inspiration. While many in Hollywood would tell us these kinds of films can’t get made, Whitta and Hancock did just that: got their screenplays on screen. What can we learn from these two men about the art of cinematic storytelling? • Write a story you can fight for, a story that HAS to get made because of the power of the message. • Write a story a big star can get excited about. • Many people like stories of salvation, redemption, transformation. There is an audience for this subject matter. Don’t forget it. • Write a story with spiritually uplifting themes, especially during times of trouble when people need it most. • In the Poetics, Aristotle teaches writers to tap into universal themes through their specific stories. Be universal. Tell us a story we can all understand and relate to. • Write what you believe in. • Don’t worry about what a studio executive, producer, or agent may say. • Find a network that will support you and your project. • Be true to yourself, your faith, your passion. • And while we're on the subject of true, for goodness sake, say something true.